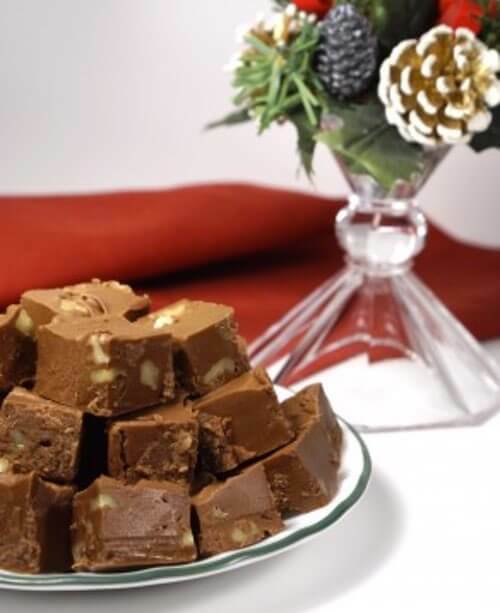 Grandma's old fashioned Christmas fudge recipes can help to bring enjoyment to your entire family. Imagine a plateful of soft, creamy chocolate fudge sitting on the coffee table just waiting to be nibbled on while playing your family's favorite board game or while watching a Christmas movie on television. Enjoy making platefuls of homemade candy this holiday time. Perhaps the favorite Christmas candy of all is fudge, when it is soft and creamy, and sometimes made very interesting with fruit and nuts. The secret in getting a good texture is to allow the candy to cool before you beat it and add the extras — so many people think it should be beaten as soon as it is removed from the fire. 2 cups sugar, 2/3 cup rich milk, 2 squares chocolate, 2 tablespoons butter, 1 teaspoon vanilla. Grate the chocolate. Put the sugar and milk in an enameled saucepan and stir until dissolved; then cook without stirring until a little syrup dropped into cold water will form a soft ball (cook until thermometer shows 238°F, if you have one). Add the grated chocolate and the butter, stir enough to mix, and let the candy cool. When cool, pour it out onto a marble slab or a clean porcelain tabletop or a big platter, and let it become quite cold. Then work it with a spatula, backward and forward, or you can use a small butter paddle or other convenient tool. When creamy and stiff, spread out at once and cut into squares with a sharp knife. You can use any kind of chopped nuts in the above recipe — about 1/2 cupful to this quantity of candy; or 1/3 cup raisins may be added; or 3/4 cup chopped dates; or 1/3 cup shredded coconut. For a chocolate, candy cane fudge recipe, just add 1/4 cup crushed candy cane. Or, you can leave out the chocolate and make a delicate white cream candy, adding coconut to it, if you like; or some candied cherries, or tiny bits of cranberry, or preserved ginger; and of course, you can tint the white candy any color you like, if you have some pure vegetable food coloring. Two cups granulated sugar, one cup cream, two ounces unsweetened chocolate. Cook until it forms a soft ball when dropped in cold water. Take from fire and add piece of butter as large as two walnuts, beat until nearly cold, then pour in buttered dish, and when cold cut in squares. Chopped walnuts, dates or marshmallows may be added before beating. This candy must be stirred constantly while cooking to obtain best results. When I was a small boy growing in the early 1950s, we didn't have a TV, but during the Holiday Season we all gathered around our old GE console radio and listened to Christmas programs as Mom passed us a plateful of still-warm fudge that simply melted in your mouth. I can still recall laughing at Fibber McGee who painted the pine tree in the front yard white by mistake, instead of Molly's Christmas tree. And who could ever forget the antics of Amos 'n' Andy? Ahh... those were the days! The taste of homemade candy always brings back fond memories of those fun-filled occasions. Thanks to the old fashioned recipes above, you can create your own family memories this Christmas, memories that you'll talk about for years to come.